Decided to throw the CAME-TV ARGO Gimbal into the official DJI Ronin-M Hard Case. Parts fit almost exactly, and the case holds everything. Posted in Instagram FEED. 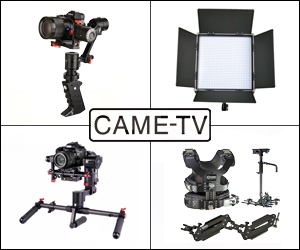 Tags: came-tv argo, dji ronin-m, Gimbal Stabilizer, hardcase gimbal on February 20, 2016 by Emm. A few weeks ago we had the opportunity to test drive the Varavon Wirecam. 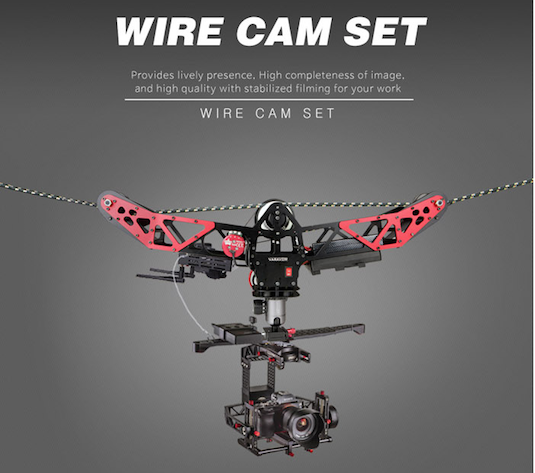 The Wirecam is a Cable Cam system that flies a camera over a rope tied between two points. Although the affordability and use of drones are increasing for aerial imaging, there are still many instances in which a Drone would either not work, would be illegal, unsafe, or would be just a noisy nuisance. Unlike most Drones that could only fly for about 20 minutes, the Varavon Wirecam could go for hours at a time. Not to mention if you wanted to fly a larger camera than just a GoPro, you'd need a fairly large Drone. In our example we were able to fly a DJI Ronin-M + GH4 + 12mm Rokinon Lens + Radian Wireless Video System. Now that we've made our point that Drones can't solve everything, here's a quick montage video (below) of us setting up and operating the system. Operating the Varavon Wirecam was extremely simple to operate as it only moves either left or right and the entire system weighs only about 7lbs (without camera). Of course this is not a tool you should show up with without some type of practice setting it up. You'll want to get a few hours in getting familiar with tying down the line, mounting your camera system, and any other accessories. The most difficult part about working with the system is finding a good place to attach the rope. Our warehouse project had plently of steel beams, but out in an open area is where you'll need to be creative. When attaching the Rope, you should brush up on your knot tying skills, carry a set of ratcheting tie downs , and I highly suggest using a Manual Come-Along to pull the braided rope tight. These will make life much easier, and you'll find that with a brand new braided rope, the braids will tighten and eventually produce enough slack that you would have to re-adjust 2-3 times before it starts settling in. You can mount a camera directly under the Wirecam, but a gimbal will help to stabilize the horizon. And If you're using a gimbal like the DJI Ronin-M that comes with a remote, you'll also be able to control Pan + Tilt as the Wirecam flies. Of course in order to frame a shot, you'll want to stream the video feed back from the camera. 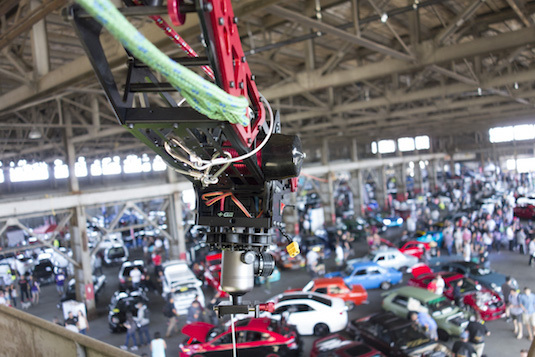 In our setup, we used the Camera Motion Research Radian Pro System. So as one operator controlled the Wirecam, a second operator controlled Pan + Tilt on the DJI Ronin-M Gimbal, and both operators shared a monitor. The Varavon Wirecam is a great option for high flying aerials when a drone system just won't cut it. I could see this cable-cam system being used heavily in sports on the sidelines of a field, lap pool, motocross track, or other events in which the camera needs to constantly repeat a forward / back or left /right tracking shot. For more information about the Varavon Wirecam vist the product pages at http://varavon.com/products/wirecam. Posted in dslr video. 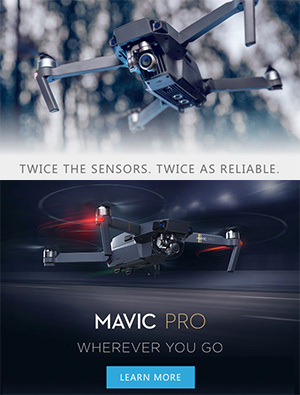 Tags: blox evo2, blox evolution, camera motion research, Come-along, DJI Drone, DJI Ronin, dji ronin-m, Gimbal Stabilizer, pier 70, Radian Pro, Varavon Wirecam, Winch, Wireless HD Video Stream HDMI on June 29, 2015 by Emm. 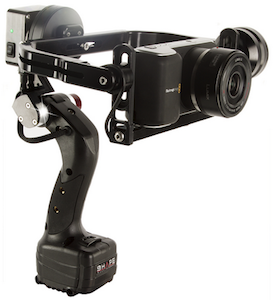 NAB 2015, SHAPE gives us an overview of two single handed pistol-grip style Gimbal stabilizers. 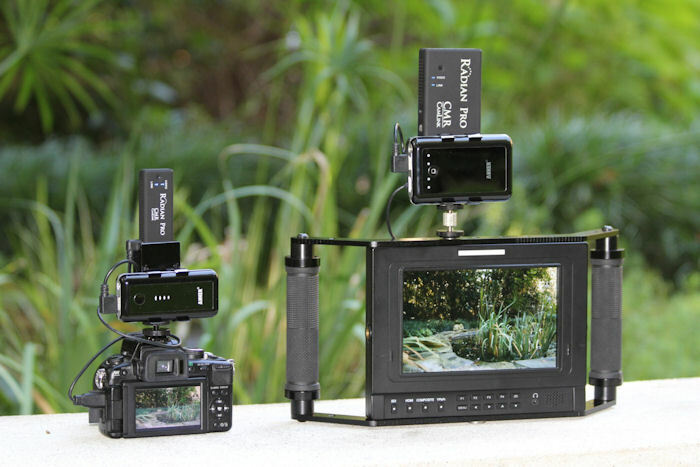 The iSEE (for GoPro) and a larger iSEE+ designed for small DSLR or mirrorless Cameras. 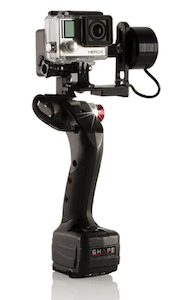 Each gimbal operates on two inexpensive and common Canon LP-E6 batteries, so you don't need to sit around and recharge. So while most GoPro gimbals don't allow you to use the GoPro in it's waterproof housing, the iSEE is designed for this. Other systems will probably not recommend using gimbals under wet conditions, but SHAPE doesn't seem to have any issues getting their iSEE gimbal wet as seen in the video below. Posted in dslr video. Tags: Gimbal Stabilizer, gopro gimbal water resistant, isee, Shape Gimbal, shape two axis 2 axis gimbal stabilizer, ShapeWLB, snowboarding gimbal stabilizer on May 14, 2015 by Emm. NAB 2014, we stop in at the Big Balance booth. 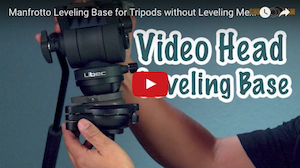 This company (at this time) is only focused on and entire product line of hand held gimbal stabilizers supporting a range from Smart Phones, Compact Cameras, Mirrorless Cameras, DSLR, and more. 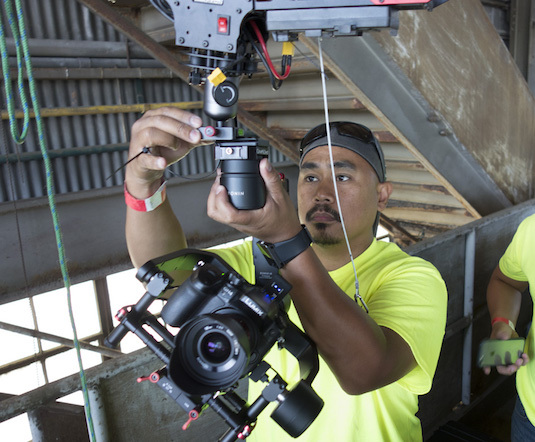 Many gimbal versions from Big Balance include a thumb stick to actively tilt the camera, and some with remote control capabilities when the gimbals are used in distance from the operator. 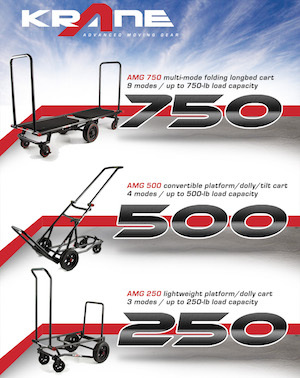 You can find more additional information about these products at the BigBalance.com website (here). Posted in dslr video. 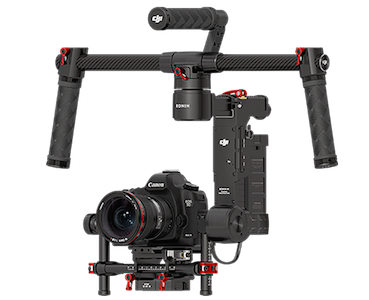 Tags: 2 3 axis stabilizer, Big Balance, BlackMagic Pocket Cinema Camera, gh4 gimbal stabilizer, Gimbal Camera Stabilizer, Gimbal Stabilizer, ipHone goPro gimbal on April 28, 2014 by Emm.